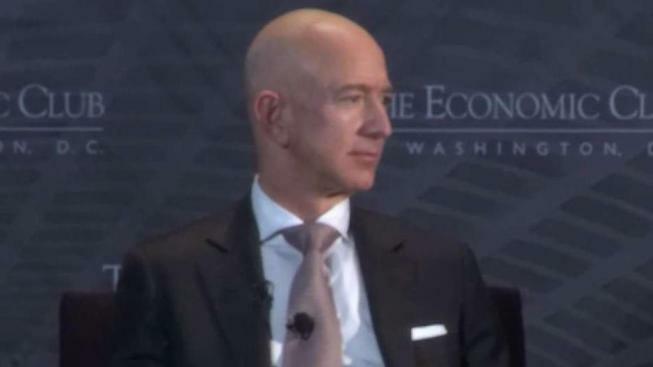 Amazon founder and CEO Jeff Bezos didn’t offer any hints Thursday night about where the second Amazon headquarters will be located, but local leaders talked about their bids during his visit to D.C.
Bezos was in town for the Economic Club of Washington, D.C.’s milestone celebration dinner at the Washington Hilton. Northern Virginia, D.C. and Montgomery County, Maryland, are on the short list of possible locations for the second headquarters, and D.C. Mayor Muriel Bowser and Maryland Gov. Larry Hogan attended the dinner. They said they are confident in their bids. Virginia Gov. Ralph Northam didn’t make it Thursday night because of Hurricane Florence. Amazon has promised 50,000 new jobs and construction spending of more than $5 billion. Bezos didn’t announce his decision Thursday, reiterating it will be made in 2018. “We will announce the decision before the end of this year,” he said.